Prior to becoming an Assistant District Attorney for District Attorney Guest, Miller was a founding partner with the firm of Miller Fulgham P.A. in Flowood, MS, practicing for several years in all aspects of circuit court practice representing both plaintiffs and defendants in civil and criminal litigation. Miller has practiced civil defense in both small and large firm settings. During his employment as an attorney with the formerly named firm of Forman Perry Watkins Krutz and Tardy, LLP, Miller defended regional and national corporations in complex toxic tort litigation filed in circuit courts throughout Mississippi. As an attorney with the formerly named Wilkins, Stephens & Tipton, P.A., Miller defended individuals and businesses in various aspects of personal injury claims involving premises liability and automobile accidents filed in circuit court. He is well experienced in appellate practice and has served as Adjunct Professor of Law in Appellate Advocacy at Mississippi College School of Law teaching brief writing involving appeals from circuit court. 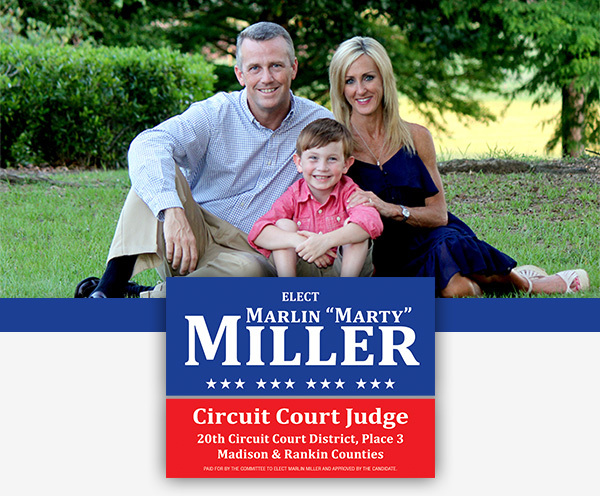 Miller also served as law clerk for the Late James E. Thomas Judge Mississippi Court of Appeals researching and writing opinions on appeals from circuit court. He earned his B.S. in Business Administration and Finance from Mississippi College in 1992. After graduating Mississippi College he worked for General Motors Acceptance Corporation as an account specialist and auditor from 1992 - 1995, before entering the University of Mississippi School of Law where he earned his J.D. in 1998. Miller has been married to the former Kimberly C. Walker, N.P., UMMC Division of Cardiology, for the past 15 years and has one son, Samuel, age 6. In his spare time Miller is an avid outdoors man, hunter and fisherman, Youth Baseball Coach, and a 31 year Mississippi High School Athletic Association (MHSAA) Official at the State High School Cross Country Meets. The Millers are members at Park Place Baptist Church.